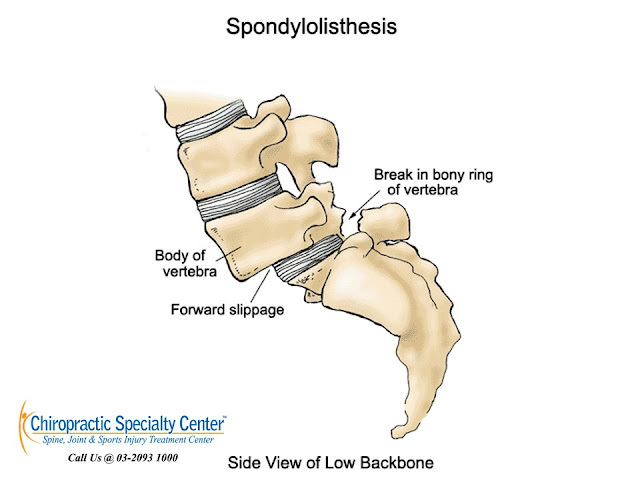 Spondylolisthesis is a forward or backward slippage of a vertebra over another. Spondylolisthesis can be found in people with no pain. However, treating a person with lower back or neck issues complicated by spondylolisthesis can be challenging as there may be pain coming from different sources at the same time. Locating the major pain generators is important in providing an effective treatment plan. The majority of the spinal problems has several pain sources. Therefore, it is important to recognize and acknowledge each and every of the pain generators. Recent research has shown that multidisciplinary treatment program has a higher success rate in managing and treating musculoskeletal problems. A disc sits in between two adjacent spinal vertebrae. The outer one-third of the disc has nerve fibers that can carry pain signals. Over-stretching or motion of the disc can cause activation of these nerve fibers and results in pain. Inflammation that occurs in the disc and spine can irritate the nerve fibers and cause pain too. Irritation of the nerve fibers in the facet joint capsule or the bone near the joint can be a major source of pain. Stretching of the joint capsule, abnormal loading of the facet joint or inflammation around the joint may irritate exiting nerve roots. The pain is usually aggravated with neck rotation and extension. People with degenerative spondylolisthesis have extra bone spurs around the joints, and hypermobile joint is more susceptible to nerve root irritation due to narrowing of the space where the nerve roots travel through. Irritation of the disc or facet joint may result in radicular pain. In the lower back, the pain may travel down into the buttocks or the legs. In the neck, the person may be complaining of a headache or upper back pain.